We specialize in one-of-a-kind custom illustrated wedding invitations, art prints, and stationery that will set your event apart from any other wedding you or your guests have ever experienced. Our exquisite designs are provided hand-in-hand with superior customer service — exactly what you have been looking for. Contact us today to bring your wedding event to life with Illustrated Weddings. Capture the spirit of your event with a beautiful custom illustrated wedding invitation suite. A gorgeous earth-inspired Amethyst wedding. Our illustrations can take any form, you aren’t limited to a drawing of your venue. This Amethyst wedding suite was featured on Brides of North Texas. Looking for a uniquely personal illustration for your save the date, wedding invitations or rehearsal dinner invitation? We also do portraits! Reach out to us if this is something you are interested in. This historic lighthouse outside San Francisco hosted a beautiful wedding surrounded by scenic views of the ocean and the Golden Gate Bridge. 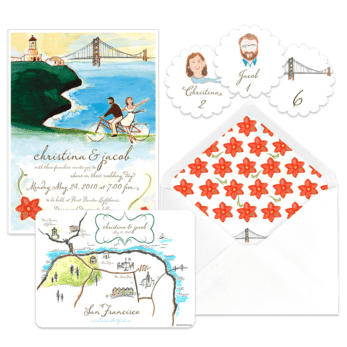 Our whimsical illustrations featured portraits of the bride and groom riding their tandem to the ceremony and included small illustrations of various landmarks and even a custom map. This wedding was featured on Snippet & Ink. You can read more about it here.